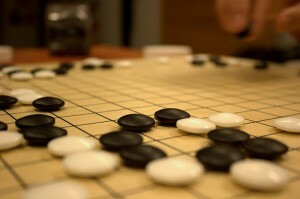 Originating in China, Go is an ancient game of strategy. The game of Go is played on a flat board divided up in to a 19 by 19 grid of evenly spaced lines. That’s 19 horizontal lines by 19 vertical lines. The board looks like a grid of squares, but it’s the lines that are the focus of the game, and the points where they intersect. Go is a two-player game with black and white discs called “stones.” One player receives 181 black stones, while the other player takes 180 white stones. There are few rules to remember, but a great many moves available, which is why Go is such a challenging game of strategy. Once those few rules and moves have been learned, it’s time to focus on the objective and winning. The object of the game is to control more “territory” than the opponent has. Once all stones have been placed on the board, whoever controls more of the board is the winner. To begin, the player holding the black stones lays a stone on the empty board. The stone goes on any of the points where a horizontal and vertical line cross, the intersection of two lines. Blacks turn has ended and white does the same, placing a stone on an intersection. Once a stone has been placed on an intersection, it cannot be moved again, unless it’s captured, in which case the stone is removed from the board. The game continues in this manner, white placing a stone at intersections, and black placing stones at intersections. Remember, any intersection can be occupied by a stone, but once occupied, it cannot be moved again. Any empty section of the board surrounded by a players stones becomes their “territory.” At the end of the game, it’s a matter of counting how many points, or intersections of territory belong to a player. As mentioned above, whoever has the greater amount of control of the board is the winner. It’s a mentally challenging exercise to gain control of the board. Stones have to be placed in a carefully thought out order, expanding territory and surrounding the stones of the opposition pieces. The complexity comes from the large amount of stones each player has and the large grid of the board. In addition, capturing of stones is possible. Surround the intersection a stone is occupying with opposing stones and the stone is captured and removed from the board. The captured stone is a “prisoner.” Prisoners are also counted along with territory to decide the winner. Let’s take a closer look at capturing. The four grid points surrounding an intersection occupied by a stone are called “liberties.” When those points are all held by opposing stones, the surrounded stone is captured. Nearby diagonal intersections don’t count as liberties. Groups of two or more stones can be simultaneously captured when their liberties are held by the opposition. Understanding Go is challenging on a 19 by 19 grid. Try using a smaller board at first. A 9 by 9 grid is excellent for beginners.